Custom built bowie knife sheaths that have been personalized with military insignias. A special sheath for a very special knife. This knife is a “collaboration project” for BladeForums.com. 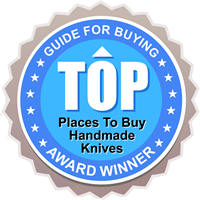 Three years in the making, it has traveled all over the country and each of about fifteen knife makers worked on it donating their time and materials for a unique project that will be auctioned off when completed for a non-profit organization. The first knife maker, a smith, forged the damascus steel for the blade. He then sent it to the next knife maker who ground out the blade. He in turn sent it to the next who attached the mokume bolsters and pommel caps. There are jade liners under the blue/green “bark” mammoth ivory handle scales. These, too, were donated and worked on by a different knife maker. The finished knife finally arrived at my knife shop for a custom-fitted sheath. I designed and built this pouch-style sheath using black alligator hide from LA. I added four round windows down the front to showcase the unique, randomly patterned mokume inlaid under the leather. The belt loop on the back was built overly large to frame the sheath and has a brass stud closure at the bottom. With the sheath completed I sent it on to the next knife maker who is in charge of building a beautiful wooden display case to house it in. A special sheath for a special bowie knife. After rebulding this fine old bowie, its owner asked for a mountain man style belt sheath, with lots of stainless steel studs. We gave him what he asked for and them some.